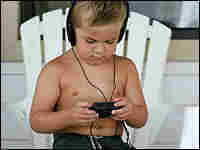 Kids' Use of Earbuds Worries Hearing Experts Earbuds that deliver sound directly to the ear canal have become increasingly popular. But hearing specialists are concerned that when earbuds are turned up too loud, they may cause lasting damage to young ears. Hearing experts are concerned that America's younger generation will experience greater hearing loss thanks to loud concerts and cranked-up headphones. The research isn't conclusive, but it's alarming enough for researchers to offer some advice on how to protect your ears. 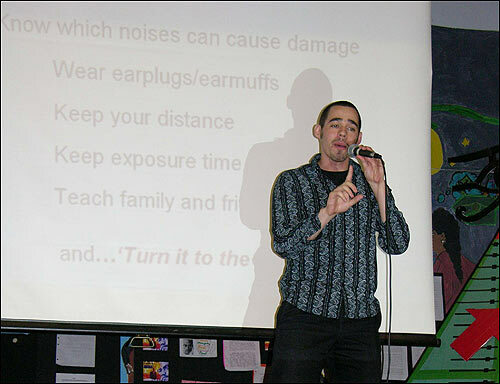 Ben Jackson's educational rap, Turn it to the Left, teaches kids about the dangers of hearing loss. 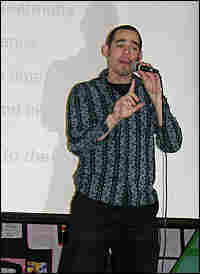 Above, he performs for middle schoolers at the Smith Leadership Academy in Boston. 'Turn it to the Left' CDs are available through the American Academy of Audiology Foundation. Created for the American Academy of Audiology, Inc. by Rhythm, Rhyme, Results, a subsidiary of Belvedere Productions, Inc. © 2007 American Academy of Audiology, Inc. All rights reserved. Lunchtime in the cafeteria at Smith Leadership Academy in Boston is a noisy affair; grabbing their trays and yelling to their friends, the 200 middle-schoolers are deafening. "If you can hear me, clap once," he says. "If you can hear me, clap twice." The young teacher is David Fassler. He suffers from hearing loss — possibly from the heavy metal concerts he attended in his youth. He has arranged a special appearance by Dr. Sharon Kujawa of the Massachusetts Eye and Ear Infirmary. She is here to convince these middle-schoolers that too much noise can be bad for them. "Every single day in our clinics," Kujawa tells the kids, "we see people with permanent hearing loss from exposure to loud sounds." Kujawa starts her physiology-of-the-ear lecture. Slides show the snail-shaped cochlea, the inner ear chamber where hearing happens. Each of the paired cochlea are lined with 16,000 little hair cells that vibrate at different sound frequencies. Those vibrations get translated into nerve signals and sound perception. But loud noise can damage the sensitive cells — or even kill them. How loud is too loud? Kujawa brings her own sound effects: She shows that regular speech registers at about 60 decibels on the sound meter. A lawn mower registers at 90 decibels. Finally, a chain saw is over 100 decibels. That's in the danger zone. Less than a half-hour of that can do damage. What about the lunchroom noise? Kujawa calls on Akeema Charles and Tyrell Pugh, two eighth-graders who earlier helped her measure the cafeteria's decibel levels. "We got 89.2, 88.6 and then 89.8," Charles reports. "That's pretty loud, you guys," Kujawa says. Then she launches into her main message, about personal stereo players. "The reason they're potentially dangerous," she says, "is because you take that little earbud and you put it down your [ear] canal, and you're this far from the source of the sound now." She holds her fingers about a half-inch apart. When he ends, the kids go wild. They're impressed. Jackson is part of Kujawa's team for personal reasons. His father Isaiah, who is looking on from the back of the cafeteria, is a classical musician — a conductor — who lost much of his hearing a few years ago. The reason is unknown. "If you shave all the hair off your head and wait six months, what happens?" Jackson asks. "It grows back," the kids yell. "Exactly," Jackson says. "Now, the reason that your ears are different — and it's crucial that you remember this — is, when you damage your ears, they don't heal. They never get better, they just get worse — slowly or quickly — throughout your life." Two-hundred middle-schoolers are completely silent as Jackson asks: "You want to be able to keep listening to music, don't ya?" Scientists are paying attention to what is happening to kids' hearing, too. Six years ago, researchers at the Centers for Disease Control and Prevention reported noise-induced hearing loss in nearly 13 percent of Americans between six and 19. Kujawa says that translates to more than 5 million young people. "To have a statistic like that certainly raised many, many red flags," she says. Some experts don't accept the way CDC researchers measured hearing loss. But even critics of that study worry about noise levels that kids are living with these days. In her research, Kujawa exposed young animals to loud noise. She found that they had accelerated hearing loss later in life, even without further noise exposure. Scientists have measured sound levels from MP3 players. At 70 percent of volume, they pump out 85 decibels — about the same as the school cafeteria. After lunch, Akeem Charles, the eighth-grader who helped Kujawa measure noise levels, plugs in her earbuds. The music from her iPod can be heard from several feet away. Charles says she listens to her iPod a couple of hours every day. After she turns it off, she sometimes hears "big time" ringing in her ears. "But ... I don't know, I just like music. I can't help it," she says. Kujawa tells the kids that ringing in the ears is a sign of imminent ear damage. It means that it's time to cut back on listening time and turn the volume to the left. Or, as Ben Jackson raps, "It ain't no fun man, it ain't no fun, when you're 13 years old and your ears are 81." Scientists disagree about whether America's kids will experience more hearing loss than their parents — and there isn't much research to settle the debate. The most-often cited study appeared in the journal Pediatrics in 2001. Researcher Amanda Sue Niskar and co-workers at the U.S. Centers for Disease Control and Prevention studied 5,249 Americans between the ages of 6 and 19. They reported that 12.5 percent showed signs of noise-induced hearing loss. Extrapolated nationally, that suggests that more than 5 million young people have damaged ears — an alarming statistic. But there are no similar national studies with which to compare it. Some experts challenge the definition of hearing loss used by the CDC researchers. "I don't think that paper is valid, frankly," says William Clark, a leading audiologist — or hearing specialist — at Washington University in St. Louis. Clark collected data on 20-year-old workers studied between 1970 and 1985 that showed no hearing loss during that period. A similar study looked at young workers with Alcoa between 1985 and 2004. Again, Clark says, there was no evidence of a decline in hearing. 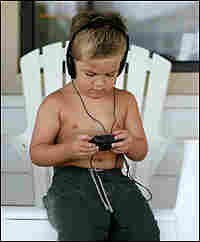 "But these findings do not mean that Walkmans or iPods or other personal stereos are not hazardous," Clark says. "They only mean that the statements about hearing getting worse in kids are not true." He worries in particular that kids are listening to loud music through headphones and earbuds for longer periods. "Twenty-five years ago, people listened to their Walkmans for a half-hour a day," he says. "These days, people listen all day long." Also, Clark says, there is a tendency to sneak the volume setting up during a listening session. 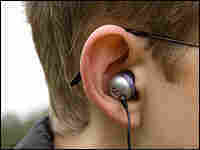 Clark estimates that 5 percent of MP3-player users listen at hazardous levels. Other audiologists have said it is closer to 15 percent or even 25 percent. But virtually all hearing experts seem to agree there is cause for concern. "The problem is, hearing loss accumulates over a lifespan," Clark says. "And the ravages of other exposures plus normal aging will contribute to an accelerated hearing loss when today's kids are in their 50s and 60s." American Speech Language Hearing Association: "Listen To Your Buds"